Many North African soldiers fought for France during the Great War and played a decisive role in it. Today we’d like to direct our attention especially to the French colonial troops, whose history still remains marginal in the commemoration of the centenary. In 1914 about 15.000 Moroccan soldiers were organised in different military formation and according to recent statistics their number oscillates between 34.000 und 40.000 throughout the war. Among the different companies of the Moroccan troops special attention is due to the Goums (from an Arabic word meaning “people”). At least 23 Goums were employed from 1914 till 1916, each of them comprising between 200 and 300 Berber auxiliaries. Goumiers first came from Algeria and were employed during the first intervention in Morocco in 1908 by the French Army. The format of these indigenous irregular troops was then adopted to enlist the Moroccan Muslim levies. Moroccan Goums were made up of men all from the same tribe or region, who often lived together in dourars with their families and were therefore tied together by strong community bonds. 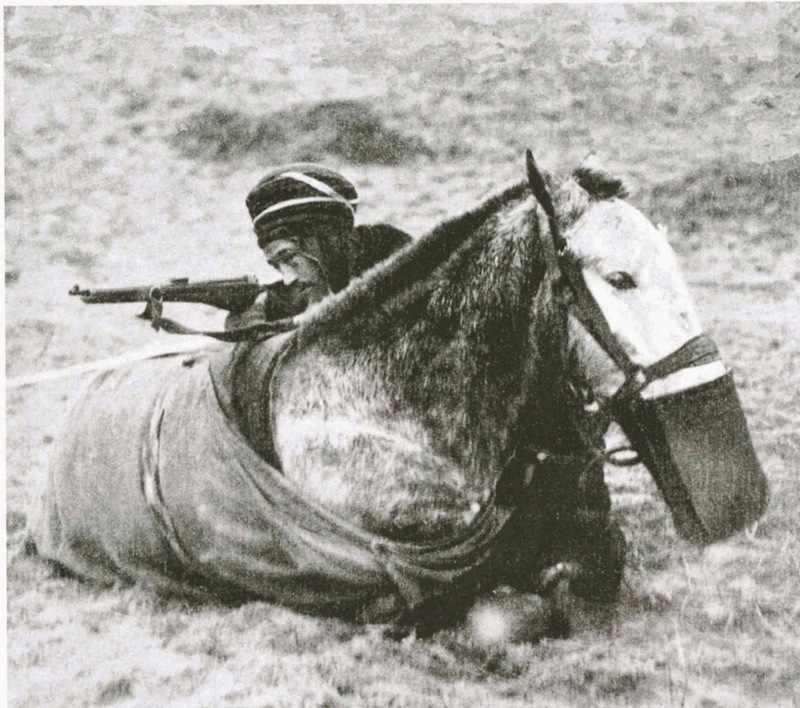 These companies remained separate from the regular Moroccan regiments of the French African Army, and usually mixed cavalry and infantry in one unit (an unusual thing for that time). Their element was the mountainous terrain of the Atlas range. Their skill and fierceness were renowned, contributing so to the “Berber myth”: Goumiers were believed to not fear death and have all physical and cultural qualities of endurance that make them perfectly fit for combat. We can find this image also in the international press, as the photo we offer today testifies. It is taken from the magazine L’illustrazione italiana, January 1915, where it was originally published to depict how the Goumiers used their horses as shield to protect themselves. But to us, today, this photo represents rather a further testimony of the hopeless symbiosis between animals and human beings in the battlefields of the Great War. We thank Eugenio Bucciol, the author of the book Animali al fronte and the editor of the same for the permission to publish this picture.